You’ve just returned to the office after another networking event. You dump those freshly-acquired business cards on your desk. You set aside a few for follow-up emails, and idly finger the rest, admiring tag lines, graphics and logos (or not.) But what should you do with all those business cards? You’ll give it some thought later, but for now, into the desk drawer they go. Dumping cards in a drawer or box = an unorganized, unsearchable mess. Storing cards in a business card binder = no way to organize in a sensible way without rearranging old cards as new ones are added. Who’s got time for that?! Alphabetizing cards = How? By last name? Business name? Category? It’s tough to stay consistent, and again, time consuming. Entering every card you receive into your database = Labor intensive, and you may be left with an address book of strangers. There are steps you can take to better manage all the business cards that come your way. After all, the point of taking someone’s card is to take action—to connect, not start a meaningless collection. If you’re strictly interested in an old-school, non-computerized system, consider using an accordion file or binder with labeled dividers. Organize cards by category, rather than alphabetically. That is, arrange cards by networking groups, professional associations, geographical area, vendors—whatever categories make sense to you. This isn’t a perfect system, but it’s better than a shoebox of cards crammed under your desk. Enter business cards manually in your computer database, whether it be Outlook, an email address book, or a more business-oriented CRM (Customer Relationship Management) program, such as ACT!, BatchBook, or Zoho. Shoeboxed (www.shoeboxed.com) a service in which you mail in your business cards (or receipts, or any kind of document) to be scanned and organized to your cloud-based Shoeboxed account. You can also import contact info to Outlook, Google Contacts, or your favorite CRM. A smartphone app such as CamCard or CardMinder. Snap a photo of a business card with your phone; the card’s image is saved, and data is added to your contacts and /or synced to another program you may be using, such as Evernote. 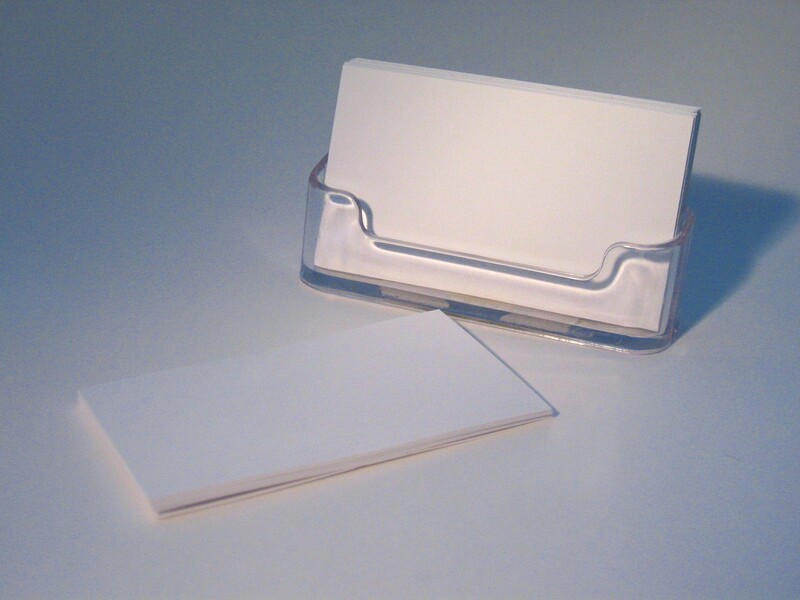 What are the advantages of scanning business cards? You contacts are searchable and easily accessed on your computer or mobile device, so you can throw away or recycle that box of cards with confidence. No matter what system you choose, be selective about keeping every business card you receive. It’s ok to discretely dispose of cards that you’re unlikely to ever need. Finally, when you meet a promising new contact, immediately schedule a time to follow up. After all, unless you take action, your networking efforts will go nowhere, no matter how well you organize all those cards.